In September of 1906 a young traveling theater director and actor, August Falck, put on the play Fröken Julie (Miss Julie) for the first time in Sweden. The staging was a success both artisticly and with audiences and Falck’s troupe marked their arrival in Stockholm in December with a week of sold out performances. Soon, romour spread that Falck – with Strindberg as inspiration and sympathiser – was opening a new literary stage in the capital. 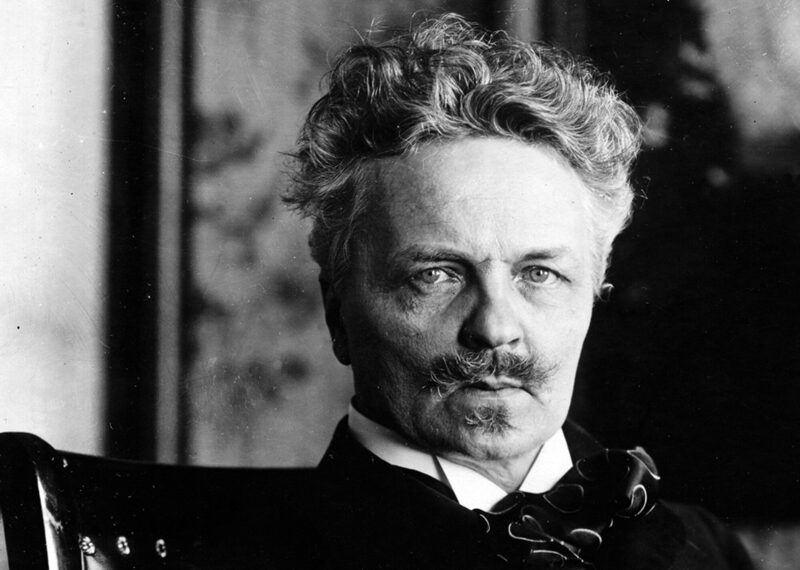 During the first half of 1907 Strindberg wrote four chamber plays: Oväder, Brända tomten, Spöksonaten och Pelikanen (Thunder in the Air, The Burned Site, The Ghost Sonata, The Pelican). The inspiration for the name ”chamber play” he found in Max Reinhardt, who in November the year before had opened a small stage, ”Kammerspiel-Haus”, in connection with the Deutsches Theater in Berlin. Strindberg described the objective of the chamber plays in an often quoted letter to Adolf Paul: ”seek the intimate in form, limited theme, treated in detail, few people, grand opinions, freedom of imagination, but based on observation, experience, well studied; simple but not simplistic; no major production, no superfluous characters, no regular five act plays or ’mechanical pieces’, no full-lenght plays” (6/1 1907). The intended venue for these new plays was Reinhardt’s small stage in Berlin and others like it in Europe, but particularly the intimate theater Falck was planning in Stocholm. It took until the summer of 1907 to find the space, a former warehouse at Norra Bantorget, which would come to house Intima Teatern for three years. During the fall it was furnished with a small stage, four by six meters, a small auditorium with 161 seats, but also what was at the time a very advanced lighting system, 9 individual dressing rooms for the actors and lavish foyers without drink services. What might be called the first alternative theater in Stockholm had been created. Twentyfive of Strindberg’s plays would be shown there, of which six were world premiers and 5 were Swedish premieres. The ensemble at Intima Teatern of 10-15 young actors, some from the school of Dramaten (the Royal Dramatic Theater) and some from various traveling theater companies. Finances were already strained from the renovation – Strindberg had to step in as a financier – and were met by often unsympathetic criticism. Strindberg was a controversial person, especially after the publication of the satricial novel Svarta Fanor (Black Banners 1907). Despite an ambitious program, many performances at Intima Teatern stage and a busy touring schedule, the venture remained financially shaky. Yet there was a growing and largely continually current repertoire; successful pieces ran for a long time while for instance the chamber plays had shorter runs. The performance schedule, with the Stockholm players and the traveling provincial troupe performed different pieces, on weekends two or three different shows on the same day, shows that the theater served as a video store or a cable TV company with pay per view for Strindberg supporters. Even so, they were never able to reach enough theatrical connaisseurs with each performance and the performance structure, as demanding as it was to the actors, did not bring the necessary financial returns. The theater went bankrupt in late 1910. Strindberg och teater. Bref till medlemmar af gamla Intima Teatern från August Strindberg [red. August Falck] (1918). Yngve Hedvall, Strindberg på Stockholmsscenen 1870–1922. August Falck, Fem år med Strindberg (1935). Gösta M. Bergman, Den moderna teaterns genombrott 1890–1925 (1966). Bertil Nolin, ”Strindberg och idén om en intim teater”, Intima teatern. Strindbergs teater 1907–1910 katalog Strindbergsmuseet (1995, 2000). Willmar Sauter, ”Eine verschrumpfte Avantgarde: Das Intima Teatern des August Strindberg”, TheaterAvantgarde, red. Erika Fischer-Lichte (1995). John Austin, Intima teatern and the formations of theatrical modernity in Sweden (University of Illinois; 1997). — ”’En reform? Falck har verkat!’ Intima teaterns betydelse i Stockholms teaterliv”, Strindbergiana. Trettonde samlingen (1998). Hans-Göran Ekman, Villornas värld. Studier i Strindbergs kammarspel (1997). August Strindberg, Teater och Intima Teatern, redigerad och kommenterad av Per Stam, Samlade Verk 64 (1999). Lars Löfgren, Svensk Teater (2003). Strindbergiana. Tjugoandra samlingen (2007). ”Intima Teatern 100 år”, med bidrag av Ture Rangström, Egil Törnqvist, Willmar Sauter, August Strindberg m.fl.